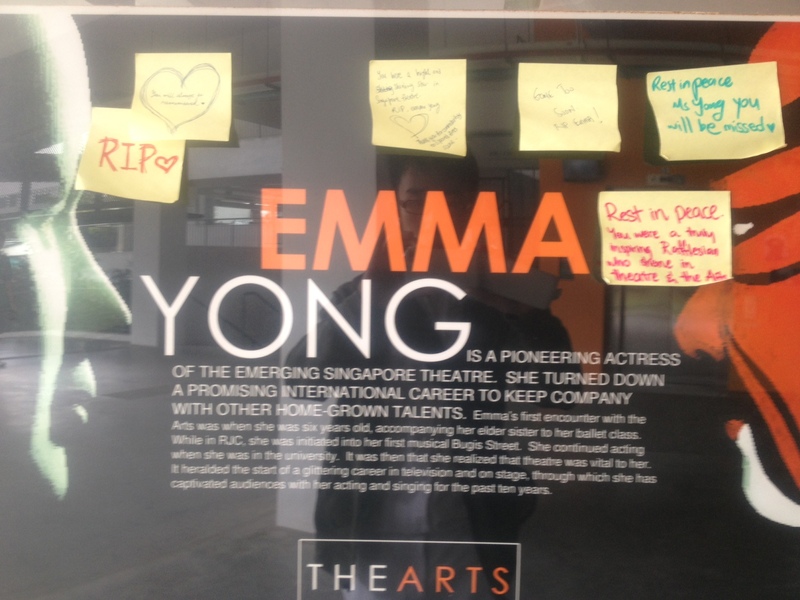 Two weeks ago, the Singapore arts scene grieved the loss of theatre starlet Emma Yong. After countless months of battling stomach cancer, the 37-year-old actress passed away on the 3rd of May at 11.22pm. Tributes were paid to her not only by those who had worked with her throughout her career but from people of all walks of life. She was a talented actress with an exceptional singing voice and had made great contributions to the local arts scene during her career. 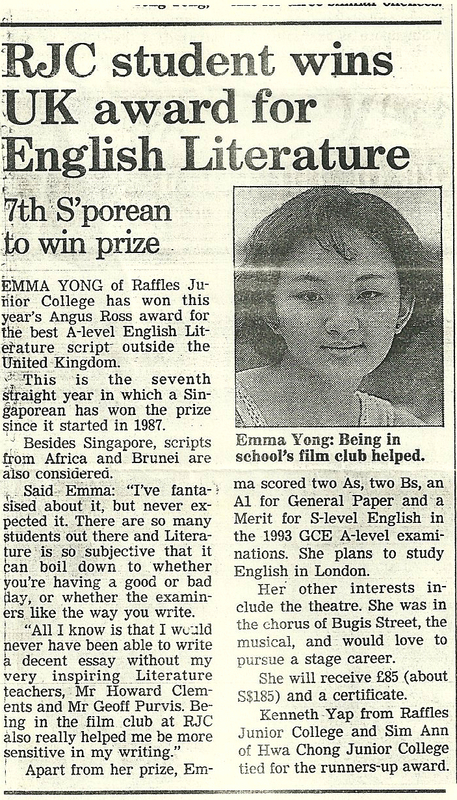 What might be more obscure is the fact that Emma was an alumnus of Raffles Junior College (RJC), graduating as part of the Class of 1993. During her time in Raffles, she was part of the school’s Humanities Programme (HP), and was taught by tutors who are still teaching in the school. “It’s sad what’s happened to her,” remarked Mr. Geoff Purvis, a HP Literature tutor. He recalled his experiences teaching Emma while she had been in school — “Emma was very bright,” he said, “she was very interested in literature, very intense … quite sharp”. Emma’s literary slant is evident from the fact that she won the Angus Ross Prize in 1994, awarded to the top non-British student in the Literature A-Levels. During her time in RJC, she performed in the school’s Dramafeste production – Chinatown Blues, a musical. It was then that her beautiful singing voice, honed during her stint in the Raffles Girls’ School choir, surfaced. Even after she left the school, she continued to perform in RJC, coming back to take part in productions regularly. Emma was also a member of the Film Society, which was inaugurated and run by her Civics Tutor Mr. Howard Clements. She was close to Mr. Clements, whom she continued to stay in touch with after leaving RJC, and said that her membership in the Film Society made a significant impact on her performance in Literature. “We all admired the fact that…talented as she was, [she did] not become yet another lawyer … [we admired] her integrity in pursuing what she loved…especially in those days when serious professional theatre in Singapore was in its infancy.” said Mr. Purvis. Pursue her passion she did. After graduating from RJC she went on to complete an honours degree in English Literature at the University College London. In 2000, she finally underwent formal acting training, finishing her postgraduate degree in musical theatre at Mountview Academy of Theatre Arts in London. She then went on to star in numerous musicals and plays during the course of her award-winning career. Most recently, she acted as Cindy in Cinderel-lah!, Una in Blackbird, Junko in Boeing Boeing, and is best remembered as part of the ever-popular Dim Sum Dollies. With Emma’s passing a beautiful talent has been lost, someone who will be fondly remembered for a long while to come. Here’s hoping that the next generation of young Singaporeans will share Emma’s courage in bravely pursuing their dreams and take Singapore’s arts scenes towards an even better age.